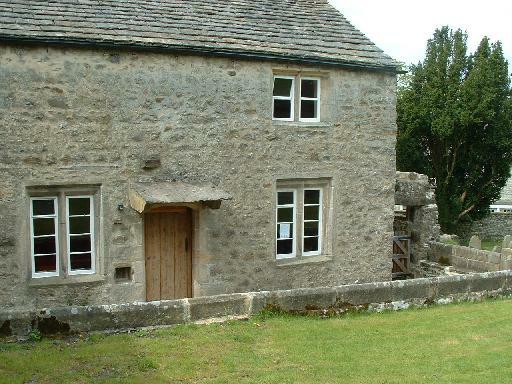 Research by members of the Malhamdale Local History Group, by Don McLellan of the Yorkshire Dales National Park Conservation and Policy Department and by others while the Airton Friends meeting house was being restored in 2008, have revealed much concerning its age, origins and development from a barn into a seventeenth-century Quaker meeting house. Interesting questions have been raised about the people and processes involved, some of which are addressed in the present paper. Much more remains to be researched and written. Among the many roots and antecedents of Quakerism, three may be singled out as particularly significant in our area: the opposition of landed gentry to attempted extensions of royal prerogative, the resistance of people “of the middling sorts” to the intellectual and financial impositions of absentee priests and tithe-farmers, and the catalytic preaching of George Fox and his associates. At least the first two of these had their own antecedents in the mid-sixteenth century. With the dissolution of the monasteries, immense land holdings were distributed, redistributed, divided and sub-divided to enrich new families of landed gentry and, soon thereafter, a large class of independent yeomen farmers, crafts workers and trades people. Stones and timber from the old monastic buildings were reused to build some of the barns, houses and field walls which replaced older, less substantial structures, while some of the lead from abbey roofs may have become Civil War bullets. Among those who prospered from the dismantling of the monastic estates was John Lambert of Calton, great grandfather of Major-General John Lambert; in 1528 he was Steward of Henry Clifford, first Earl of Cumberland, acquired Airton Manor in 1530, and by 1543 was appointed Secretary to the Council of the North. Profiting from his position as Steward of the Privy Courts at the time of the Dissolution, he obtained the former holdings of Bolton Priory in Malham, Airton, Scosthrop, Otterburn and Hellifield. His son, John, further extended the Calton estate; his grandson, Benjamin, married a daughter of Lord Clifford and purchased the manor of Kirkby Malham in 1597. However, complicated inheritance settlements and legal disputes in the early seventeenth century led to a decline in the family fortune, exacerbated by a slump in wool prices. In 1629, the manors of Calton, Airton, Kirkby Malham, Hanlith, Malham East and Malham West, all owned by the Lambert family, were leased out mainly to members of the Lister, Heber and Tempest families. In 1632, on the death of Josias Lambert, father of the future Major-General, the estate had clear title only to Calton Hall and to lands in a widow’s jointure worth £30 per annum. Probably having received his early education from Nicholas Woltan, priest and licensed master of Kirkby Malham School, who was reported in a visitation of 1632 for such radical practices as not wearing a surplice and who was ejected at the time of the Restoration, thirteen-year-old John Lambert (1619-1684) was placed by his father’s will in the care of Sir William Lister of Thornton Hall, Thornton-in-Craven. In 1638 John Lambert and Frances Lister, a daughter of Sir William, were married. This marriage extended and strengthened Lambert’s connections to several leading Yorkshire families who were part of a faction that opposed attempts to increase royal power in the north and/or who advocated religious toleration: Fairfax (of Denton, near Ilkley), Belasyse, Aske, Tempest. Later events were to show that Frances Lister was a very capable and determined person who developed friendships with people of radical and Quakerly inclination. All of these influences would have strengthened Lambert’s own strongly held advocacy of religious toleration, although it does not seem to have inclined him towards any particular religious sect or opinions. In 1642, Lambert was serving under Lord Fairfax in the Northern Association Army; during the Civil War he defeated Royalist forces in Gargrave and those attacking Thornton Hall, but could not prevent them storming his own Airton Hall and taking 60 prisoners to Skipton Castle. He was involved with the army revolt and the settlement offered to Charles I in 1647, and was largely instrumental in the conquest of Scotland in 1650 and 1651, where James Nayler, from Wakefield, served as his quartermaster. In 1653 Lambert drafted, or more likely assisted with drafting, the Instrument of Government whereby Oliver Cromwell was made Lord Protector. As he was an outspoken and determined advocate of religious toleration, the wording of clauses 35, 36 and 37, which are very nearly the same as those of the 9th article of the Agreement of the People presented to House of Commons in January 1648/9, may have been his own. Mention has already been made and will be made again of James Nayler, from West Ardsley near Wakefield, who became a leading member of the first generation of Quakers. Others of Lamberts associates who became early Friends (the title by which Quakers referred to themselves, as Friends in the Truth) included John Hodgson of Threshfield - a captain and surgeon under Lambert, Amor Stoddart, Mark Grime - a close political ally and deputy Lieutenant-Colonel under Lambert and Robert Lilburne. Captain Adam Baynes, an associate of John Lambert and correspondent of Frances Lambert, was a member of Parliament and a magistrate who by 1655 was particularly friendly to Quakers. Another of Lambert’s associates was the religious radical John Webster, who as curate of Kildwick-in-Craven in 1634 had been much influenced by the Grindletonian followers of Roger Brearley; he served as a chaplain under Lambert and was closely associated with another radical, William Earby, who was also in Lambert’s regiment in 1647. Both Webster and Earby apparently influenced the thought of early Quakers, and clause 37 of the Instrument of Government parallels a statement by Webster in his The Saints Guide of 1653. Our meeting house and its associated buildings and land were purchased by William and Alice Ellis from John Lambert, son of Major General John Lambert, in 1700. As the younger John Lambert was survived only by a married daughter, the family line was extinguished with his death in 1701. His impending demise and the anticipated sale of the Lambert estate in Malhamdale is likely to have been the reason for the Ellises then purchasing the property, almost half a century after Friends first began using it. The second of our three factors, the rise of a large class of people described by their contemporaries as being “of the middling sorts”, independent craftsmen, yeomen farmers and others who could support themselves without being closely tied to overlords and who had learned to read and think for themselves, is implied in the list of names just given. In the swirl of opinion and counter opinion that characterised the period from the mid-sixteenth to the late-seventeenth century, a welter of sects and theologies was formulated, reflecting their needs and enthusiasms. One such group, named after the town of Grindleton, 2 miles from Downham, was initially led by the curate Roger Brearley. These people observed a very simple form of worship, trusted the direct inspiration of God’s spirit, and did not restrict preaching and prayer to an anointed clergy. The Grindletonian, John Webster, mentioned above, was active in the Pendle area in the 1650s. Among the more influential early Quakers who may have had Grindletonian attachments are John Chapman, Francis Howgill and Thomas Bancroft. While there is no particular evidence of this, it seems most likely that James Nayler, whose home was about 50 miles from Grindleton, would have been well aware of, and perhaps influenced by the ideas of Brearley and Webster..
Another major group of loosely affiliated independent congregations, mainly based in Swaledale and in Preston Patrick, called themselves Seekers; they frequently met in silence to wait until God Himself would show them a better way of worship. Two of their leaders, the brothers Thomas and Christopher Taylor, from Carleton near Skipton, became influential Quakers. The rapid, early adoption and spread of Quakerism in Malhamdale, in Upper Wharfedale and around Skipton suggests that in the early- to mid-seventeenth century these areas may have supported many people of independent thought who perhaps, like Major-General Lambert, acknowledged no particular religious designation or affiliation. In addition to those who held what were for their time radical religious convictions, there were many others whose radicalism was more political than religious and who supported the Parliamentary army in its attempts to obtain a more democratic form of government. One such family may have been that of Henry Holgate, yeoman. In 1656, he and his wife, Mary, together with their eldest son and his wife, assigned to their younger son, George, a house and 3 oxgangs of land (probably 30 acres or more) in Airton. Several deeds (in the Raistrick papers) relating to this transaction describe George Holgate as being a soldier in George Watkinson’s troop of Col. Robert Lilburne’s Regiment. While Civil War affiliations are know to have split some family loyalties, in this instance it looks like the entire family sufficiently approved of the young man’s enlistment to agree to settle upon him an inheritance which might have been withheld until the decease of his parents or denied altogether. Robert Lilburne was one of the most radical of the army’s political leaders, and it is most likely that George Holgate and through him the rest of his family were exposed to and supported Lilburne’s democratic and egalitarian principles. Towards the end of his life, Lilburne joined with Friends and became a Quaker; perhaps George Holgate did likewise. A possible example of a family with split loyalties is hinted at by an entry in the Kirkby Malham parish register recording the burial in May 1682 of “Anne, daughter of William Atkinson Quaker of Kirkby”. Because they denied the need for and chose to avoid all forms of priestly intervention, Quakers maintained their own records of births, marriages, deaths and burials and used their own burial plots. While Anne Atkinson may have renounced or moved away from her parents’ faith, other members of her family remained Friends. Thomas Atkinson of Malham was buried in the Airton meeting house burial ground in 1706. The third antecedent to the Quaker movement was the teaching and activities of George Fox, particularly his perambulations or mission through the northwest of England in 1652. The traditional, romantic Quaker view of this is given by Elfrida Vipont Foulds (pp 13, 15). The historic events of 1652 began when George Fox felt moved by God to climb Pendle Hill. There he saw a vision of a great people to be gathered, a vision which	proved to be prophetic, for when he followed in the direction indicated, he found the Westmorland Seekers…, who were eagerly awaiting fresh light in their search for Truth…. Travelling through the Dales, George Fox came to Brigflatts, where he …. These momentous weeks saw the birth of the Society of Friends as an organized body. By focusing our attention on the first part of Fox’s journey, northwards from Pendle Hill, we may attempt to come even closer to the formal beginnings of Quakerism and in doing so to obtain a more convincing, if less rose-tinted, understanding of the beginnings of this religious movement. George Fox, born in 1624 in Drayton-in-the-Clay, Leicestershire, completed his apprenticeship to a shoemaker and left home in 1643 to travel in search of religious enlightenment. Visiting the Home Counties, London, Manchester, Nottinghamshire, Derbyshire and Warwickshire, he entered into debates and discussions in which he gradually assumed a position of leadership among like-minded friends (before Quakerism became an organised movement, the appellation was generally used with a lowercase f), to whom he preached about the possibility of direct communion with God, the need for sincerity and personal integrity; he opposed the idea of universal sinfulness and the hypocrisy of paid clergy. He was imprisoned for disturbing the peace in Nottinghamshire in 1650 and, later the same year, in Derby, where the name Quaker was first coined when Fox told Justice Bennet to tremble at the word of God. On release from prison in 1651, he travelled through Derbyshire, Nottinghamshire, and parts of Yorkshire, visiting Balby, York, Cleveland, and back to Lincolnshire, preaching, making contacts and friendships, and finding auditors almost wherever he went, some of whom accepted his understanding, that God teaches his people Himself, without the need for intermediary priests, rituals, or consecrated “steeple houses”. While in Yorkshire, George Fox met James Nayler, of West Ardsley near Wakefield, who was convinced of the rightness of Fox’s message and himself became a leading Quaker preacher. In discussing who else would be open to this new understanding, Nayler and others are likely to have spoken of the Grindletonians, of Lambert’s radically-minded associates, and of the Seeker congregations, and to have urged Fox to travel west to speak with them. If we reject the somewhat fey idea that, contrary to all the evidence that he was in fact a very practical and astute person, George Fox wandered about the countryside at random waiting for the leadings of chance inspiration, we must ask how he came to be anywhere near Pendle Hill and then, at the most opportune time of year in Sedburgh. I suggest that at least an approximate itinerary had been worked out before he embarked on what was to become the most significant of his travels, and that this itinerary was based on visits to known centres of religious radicalism, independent congregations, and potentially sympathetic magistrates and leading personalities. Foremost among those to be visited are likely to have been the people of Grindleton and whichever members of the liberal Fairfax-Lister-Tempest alliance would receive him. Major General Lambert and his wife, Frances, would have been particularly high on this list. May or June 1652 found George Fox and a companion, Richard Farnsworth, in Bradford embarking on a journey which began at Pendle Hill between Colne and Clitheroe, visited Sedburgh at the time of the hiring fair, ended at Swarthmoor Hall near Ulverston, and is generally credited by Friends as marking the formal inception of our Religious Society. Unfortunately for our purposes, Fox’s retrospective accounts of his itinerary omit Craven place names and seem to conflate several visits he made to Yorkshire, while William Sewell’s History mentions nothing between Bradford and Sedbergh except that Fox travelled part of the way with Richard Farnsworth and that one night they slept in an open field. As there are no more precise records of these travels and the only probable intermediate point mentioned between Pendle Hill and Brigflatts near Sedburgh is Scarhouse in Langstrothdale, reconstructing a plausible route is the best we can hope to do. The first question must be why start at Pendle Hill? Perhaps it was not a premeditated destination (all the evidence of Fox’s writings is that he cared intensely about people and not at all about natural scenery); perhaps they had set out to visit John Webster and the people of Grindleton, or perhaps they were heading for Downham to meet Ralph Assheton, who was a member of the Long Parliament and one of Cromwell’s chief men of arms. The Assheton home was a jointure house of the Lister family; in 1648, Oliver Cromwell and John Lambert conferred there while the New Model Army was quartered in Downham on the way to the battle of Preston. Since at least the time of Moses, climbing mountains, alone, to receive inspiration from God had been a thing that prophets did, and the sight of Pendle Hill large on the horizon whether viewed from Grindleton or from Downham may have inspired Fox to leave his companion at the bottom and do likewise. In their reconstruction of Fox’s route, David and Anthea Boulton suggest that he may have gone from Pendle Hill to Wigglesworth (a Quaker burial ground nearby at Eldroth, established in 1662, attests the early presence of Friends in this area) and thence to Long Preston, up Scalehaw Lane to Langber Lane junction, over High Ings and down to Kirkby Malham. A gentler and probably more frequented route into Malhamdale was by way of Gisburn and Hellifield to Otterburn and Airton. Alternatively, Malhamdale could have been avoided by going from Gisburn to Gargrave, Flasby, Hetton, Rylstone, Threshfield and up Wharfedale to Langstrothdale. 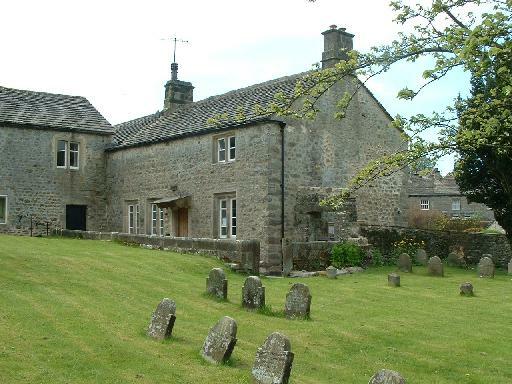 Friends meetings were held at Scale House, Rylstone, home of William Watkinson, from 1653 to 1675; a Quaker burial ground at Rylstone was in use from 1657, and the Airton Quaker burial ground from 1663. However, the fact that the Watkinson family were energetic in their support of Quakerism from 1653 onwards, but had not been convinced by Fox’s message in 1652, suggests that he did not pass through Rylstone on his first journey in these parts and that they did not meet him on this occasion. Place names indicated on John Speed’s 1610 map of Yorkshire, which is likely to have been known to and consulted by Fox and Farnsworth, include in an almost direct SW to NE line: Cledero, Gisborne, Hellifield, Caulten and Kilnsey, and thence in an almost straight NW direction up the river Wharfe and through Langstreth Dale Chase to Dent and on to Sedber. Owing to the greatness of John Lambert, who in the early to mid 1650s was at the height of his power and influence, and his well-known support for democratic causes and for religious toleration, it seems more probable that Fox would have gone to Calton for the purpose of meeting Lambert’s associates, Frances Lambert and John Lambert himself, should he have been at home, than that he would either have bypassed Malhamdale or passed through without stopping. Airton or Calton would have been a good place to look for refreshment or to spend the night. Since the purpose of his travels was to speak and debate wherever he went, we may conjecture that George Fox was allowed to hold a meeting in the recently-built stone barn in front of Airton Hall (the Lambert’s dower house) which subsequently became the Airton Friends meeting house. From Airton or Calton, there are easy walks either to Bordley, then along Mastiles Lane to Threshfield and up Wharfedale, or up Calton Moor, across to Boss Moor, and down into Threshfield. 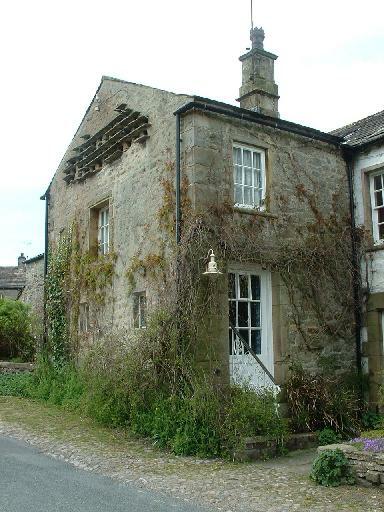 In Langstrothdale, Fox’s destination was Scarhouse, the home of James Tennant, who also had land in Skipton. This substantial house and land, including a plot used as an early Quaker burial ground, had been leased from the Earl of Cumberland in 1650. As a result of Fox’s visit, the Tennants became Quakers and their home was for many years a Friends meeting place. In 1677 it was the scene of a large gathering of Friends addressed by George Fox. James Tennant was imprisoned in York Castle in 1655 for refusing to pay church tithes. From Scarhouse, Fox travelled to Sedbergh, where he met with and convinced many Seekers, including Thomas and Christopher Taylor, and others of the truthfulness of his religious insights, and then westward to Swarthmoor Hall, where Margaret Fell dedicated her talents and her house to creating an administrative centre and spiritual home for the emerging Religious Society. Having set the scene, we are now in a position to look at the seventeenth-century, ling-thatched stone barn which was adapted to become the Airton Quaker meeting house that stands today. That this building was originally a thatched barn is attested most obviously by its massive foundation stones and by re-used crux beams in its roof. 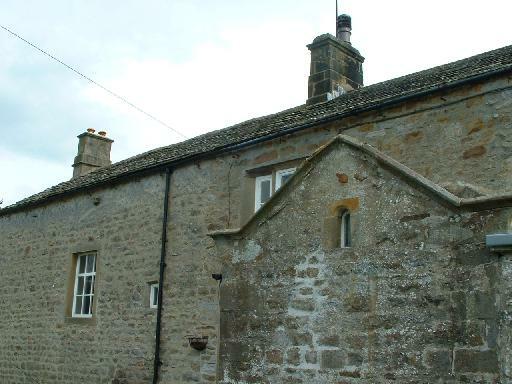 Placement of the quoins where it adjoins a cottage built in 1710, now called The Nook, shows both how low the original walls had been and that the barn predates the cottage. Inside, the oak wainscot panelling and the partition wall with its drop shutters date to the seventeenth century. These characteristic features of early Quaker meeting houses attest to the building’s long use by Friends. Rylstone meeting house, built on The Raikes between Rylstone and Hetton in about 1712 and used for Quaker meetings for worship until 1792, is thought to have had a very similar configuration of rooms, windows, gallery and fireplace, but may not have had drop shutters between its large and small meeting rooms. That Airton Friends meetings were undisturbed by crowds of informers and rabble rousers come to turf out the Quakers and destroy their property, as happened in many other early Quaker meetings, is attested by the intact presence of this original woodwork. While Besse’s compilation of the most notable persecutions and tribulations of Friends up until the Act of Toleration in 1689 includes multiple instances from Skipton, Gargrave, Settle, Giggleswick and one from Flasby, none are listed from Airton or elsewhere in Malhamdale, nor from Rylstone or Hetton. Until his own imprisonment in 1660, this happy circumstance may have been due to the influence of Major General Lambert, on whose land Airton meeting house and its adjacent stable were situated. As the royalist and establishment interests became increasingly powerful, Friends in Malhamdale, like those throughout England, were fined and imprisoned for such offences as not paying church tithes, failing to attend the established church services, for holding their own (unlicensed) religious meetings, and for refusing to swear in court or take the loyalty oath. In 1678, William Andersen of Kirkby Malhamdale and John Hall of Airton were fined for not paying church tithes; in 1681, John Squire of Airton had 20 stooks of barley taken and Thomas Hall of Airton had wool and lambs taken in 1682, both for failure to pay church tithes. Simon Wilkinson, of Know Bank Farm in Bordley, also suffered repeatedly for his Quaker testimonies. 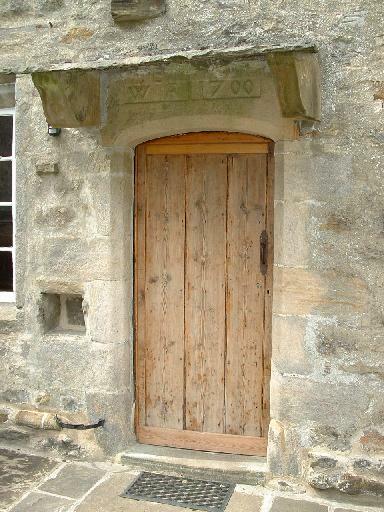 The Airton Friends’ property was purchased from the Lambert estate in 1700, for £31; the purchase by William and Alice Ellis is commemorated by their initials and the date carved into the door lintel. According to the deed of purchase, the property comprised all that one parcel of arable or meadow land commonly called The Croft containing by estimation half an acre be the same more or less and all that one house, barn or stable situate standing and being on that part of the said parcel of ground which doth adjoyne to the Common Street in the said Ayrton. The building referred to would have been the original seventeenth century barn, which by then had been converted into a meeting house, having had its roof heightened, and its oak-floored gallery, raised bench along the west wall, oak partition screen and wainscot panelling inserted. The seventeenth century chimney which now serves a fireplace in the eighteenth century cottage is likely originally to have served a fireplace on the west gable wall of the meeting house. It is not clear how such a fireplace would have related to the seventeenth century high bench and panelling along that wall. The present south-facing windows, pine wainscoting, lower facing bench and fireplaces are eighteenth century replacements of earlier, probably similar, features. Adjoining the meeting house on the west was a small stable for the horses of those who came to meetings. In 1710, the year after William’s death, Alice Ellis had the original stable replaced by a cottage for a Resident Friend and the present barn built at right angles to the meeting house. That the remains of the stone canopy over the first floor (west) barn entrance resemble the canopy over the meeting house door, suggests that both are of the same age, and that some remodelling of the meeting house may have taken place while the cottage and barn were being constructed. This may have included altering its roof height to match that of the cottage, replacement of its south-facing windows and insertion of the date stone with initials. Most of the dressed stones of these windows appear not to have been newly carved, but brought in from elsewhere and pieced together or re-trimmed to fit. 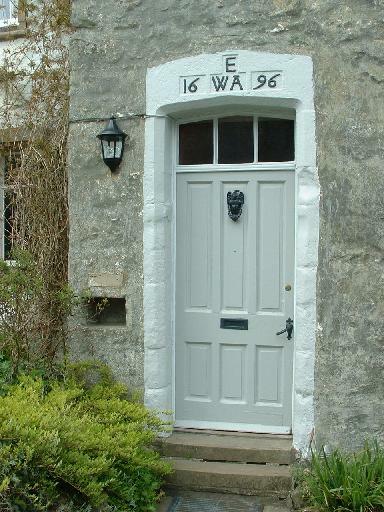 The same is true of the date stone over the door: tooling marks suggest it was re-cut to fit the existing space. In any case, the initials (of William and Alice Ellis) are such as would have been put over a house door. In keeping with Friends’ practices of simplicity and reluctance to commemorate individuals, early meeting houses usually have dates without initials, as at Farfield, Skipton and Settle meeting houses. Perhaps the windows and the carved lintel came from a remodelling of the Ellis’s house across the road in 1710 while The Nook was being built, or perhaps after the death of Alice Ellis in 1720. The eighteenth-century fireplaces and chimney may have been put in at the same time. The chimney stack between The Nook and the meeting house is of seventeenth-century style, while that on the east gable of the meeting house is eighteenth century. Construction of the cottage would have necessitated blocking a probable window in the west gable end of the meeting house and its replacement by the unusual small side window which provides light for the raised bench. This extra light was needed because senior Friends sitting on the raised bench were more likely than others to read out letters from other Quaker meetings, Bible passages, etc. The 1951 account of the charitable trusts of Brighouse, Leeds and Settle Monthly Meetings says that the meeting house, cottage and stable had been leased by William and Alice Ellis from John Lambert, son of the Major-General, in March 1700 for a term of 5,000 years, and given by the Ellises in trust to Friends in 1706, with the intention that any rents which might be obtained from the property should be applied towards repair of the meeting house and the premises adjoining. The deed of conveyance to trustees speaks of the meeting house and the stable for them to put their horses in, together with a croft of which part was to be for burials and the remainder for getting of hay on for their horses when they shall meet. A blocked-off gateway to the hay meadow can be seen in the south perimeter wall of the burial ground. In 1720, Alice Ellis’s will confirmed the gift to Quaker trustees of the meeting house and adjoining cottage, barn and burial ground and added to it 29 acres of land in the township of Airton, turbary on the moors, and the Ellis’s own house and workshops and another cottage opposite the meeting house. Income from these properties was to be used to provide hospitality for travelling Quaker ministers, apprenticeships for Quaker children and for the children of families living in Airton, and cloaks to be lent to men and women Friends travelling to and from Airton. his Back thereon to his dying Day. These excerpts imply that Quaker meetings were held frequently in Airton, sometimes in silence, sometimes with the spoken ministry of a prominent travelling Friend, and that they were held neither in the open air nor in a hastily rearranged house, but in a building furnished with seats (perhaps backless benches) and its own external door. Nothing in this account suggests that such meetings were then a novelty or were recently initiated. If John Hall began a seven-year apprenticeship when he was fourteen and we allow a few years from his setting up on his own to his joining with Friends, the meetings he first attended would have taken place in about 1660. Gervais Benson made several visits to our area, including one to Skipton in 1656, it may have been then or a few years later when his silent ministry so impressed John Hall. These considerations probably date the adoption and initial adaptation of the pre-existing stone barn to serve as the Airton Friends meeting house to sometime in the 1650s and, according to one’s inclination, suggest either that George Fox probably did or that he possibly may have spoken here in 1652. The first recorded interment in the Quaker burial ground alongside the meeting house was in 1663, although the oldest grave marker dates only to 1859, as earlier Friends did not choose to commemorate individuals this way. (A list of the known interments in the Airton Friends burial ground is published electronically at http://www.kirkbymalham.info/ . )That during the past three hundred and fifty or more years the building has remained in use as a Friends meeting place and has largely retained its early character makes it an almost unique embodiment of the initial phases of Quaker history. According to local records, the Quakers John Hall of Airton and William Anderson of Kirkby Malhamdale had property taken by bailiffs in 1678 on account of their refusals to pay church tithes; since the incident is not recorded by Besse, the value of goods taken may not have been disproportionate to the amount that was claimed for such dues. Later, probably in about 1680, John Hall moved to Skipton where he kept a temperance inn, continued as a faithful Quaker, had his goods and family possessions distrained for the non-payment of church tithes and was briefly imprisoned several times for attending Quaker meetings. In November 1682, eighteen Skipton Friends were fined a total of £44 for attending an illegal religious meeting; among their number, John Hall was fined £9 for speaking at that meeting and would have been fined £20 had he had the wherewithal to pay that much. He was closely involved with the building of Skipton meeting house in 1693; his son, David Hall, kept a Quaker boarding school in Skipton from about 1703 to 1757. A letter written by George Fox in 1689 (Barclay pp. 311-7) is germane to understanding the early development of Quakerism in the Skipton-Malhamdale-Upper Wharfedale area, and so worth quoting here at length. This letter makes it clear that during Quakerism’s first decade, there was an almost constant stream of Friends with seemingly boundless energy and enthusiasm visiting our area, holding meetings for worship, preaching and debating with all who cared to listen. Meeting … and they had a meeting settled there for the same purpose. Lord’s counsel,) or in advice in sufferings, or in any other matters. In addition to the Yearly and Monthly Meetings mentioned by Fox, General meetings of Friends in the North were held alternately in Skipton and at Scale House near Rylstone and a major regional gathering at Scarhouse in Langstrothdale was addressed by him in 1677. The Watkinson family, who lived at Scale House, were active in support of Friends from the time they joined in 1653. Other active, public Friends from Rylstone were John Hill and Richard Scosthrop, who first persecuted but later joined with Friends. There would have been constant visiting and marriages between Malhamdale Friends and their contemporaries in Skipton, Upper Wharfedale and Langstrothdale, as well as favouring one another when it came to business dealings and to the placing of youths in apprenticeships and in domestic service. The Quakers Richard Wilkinson, son of Simon Wilkinson of Knowbanke (near Bordley), and Margaret Hall, daughter of John Hall of Airton, were married under the care of Settle Monthly Meeting in 1677. Only with the passing of the Act of Toleration in 1689 were religious dissenters including Friends allowed to hold meetings and to own their own premises in which to do so. Among the first places licensed for Quaker worship in our area were meeting houses in Addingham (Farfield), Airton, Arncliffe, Cracoe, Gargrave, Hetton, Rylstone, and Settle, and the homes of John Hall and of several others in Skipton. Stephen Ellis, a hand-loom linen weaver in Calton, would have been a contemporary of John Hall, perhaps supplying him with cloth that was made into clothing for the Lambert family, it being a small world in those days. One of Stephen’s children, William Ellis (1658-1709), who was christened in Kirkby Malham church, was in 1674 apprenticed to John Stott, a Quaker linen weaver in Skipton, perhaps having been recommended to Stephen and William Ellis by John Hall. Two years later, after attending a Quaker meeting at Lower Bradley, about two miles southwest of Skipton, William joined with Friends, and was soon recognised as having a gift of spoken ministry. In about 1679 he moved to Airton, where he built a home and hand-loom workshops on land between Airton Hall, the Lambert Dower House, and the Friends meeting house. (Airton mill was then a small corn mill; only much later was it converted to cotton weaving.) Alice Davie, whom he married in 1688, managed the weaving business during William’s absences while he travelled, at his own expense, as a ministering Friend. He began such travels even before his marriage: in 1686 he was in East Yorkshire, in the south of England in about 1690, in Ireland in 1694. In 1697 and 1698 he made an extended visit to North America. Over the course of about one-and-a-half years, he held meetings and visited Friends in Carolina, Virginia, Maryland, Pennsylvania, East and West Jersey, Long Island and Rhode Island. Subsequent to his safe return in 1699, he maintained an active correspondence with Friends in all the places he had visited. His was a major influence in helping the Religious Society of Friends in Britain and in the New World mature from its sometimes turbulent beginnings. In 1700, York Quarterly Meeting gave James Conyers of Rilston a grant to assist with his emigration, presumably his decision to leave England was influenced by William’s reports of life in North America. Alice Ellis (died 1720, her date and place of birth are unknown) was an active participant in Friends affairs in England. Their only child, a son born in 1692, lived for just one year. Thereafter each of the Ellises gave a large portion of their efforts and income to working for what was to become the Religious Society of Friends. In addition to supervising the weavers and weaving business while William was abroad, Alice welcomed visiting Friends and travelling ministers to their home, travelled and herself spoke as a minister in meetings for worship. She was an active participant in the regional and national conduct of Friends’ organisational affairs; and it may have been she who first devised the partition screen with hanging shutters, which is a characteristic feature of many early Friends meeting houses. The Ellis’s business prospered so that as a master linen weaver, he was able to employ “a considerable number” of young men. Two letters written by William Ellis in 1697 (Backhouse 1849, pp 29 & 33) are of particular interest. The first of these, from London, is addressed to Simeon Wilkinson, with the rest of my servants; in it he urges them to attend midweek Quaker meetings and to consider why there are so many that fall asleep when met together to worship God. The second letter, from Airton, has no named addressee and is dated the 24th of the 6th month 1697, shortly before William sailed to America, I gave you a hint before, how I got up a meeting house;… Many public-Friends come to us, and great numbers of people at times;… From the first of these letters it may be deduced that regular midweek as well as first-day meetings were held in the meeting house across the road from the workshop, as it is unlikely that the business would have prospered if those by whom it was staffed had been allowed time to go further afield. Drowsiness at these meetings may have arisen from people who led physically active lives, usually outdoors or in unheated rooms, having an opportunity to sit at ease in a room which was probably heated by a fireplace and chimney, they and windows in the south wall being replaced in the eighteenth century by those which now exist. In the second letter, William Ellis speaks not of having built, but of having got up a meeting house in Airton some years previously. This implies the improvement or furnishing of an existing building (the original field barn, which by then had been in use as a Quaker meeting house for the better part of half a century) and probably dates the oak panelling, screen wall and some other features to the mid 1690s. The mention of great numbers of people suggests that the oak-floored gallery likewise dates to the seventeenth century, although its front facing panels are not in their original position. There is, according to Thislethwaite (pp. 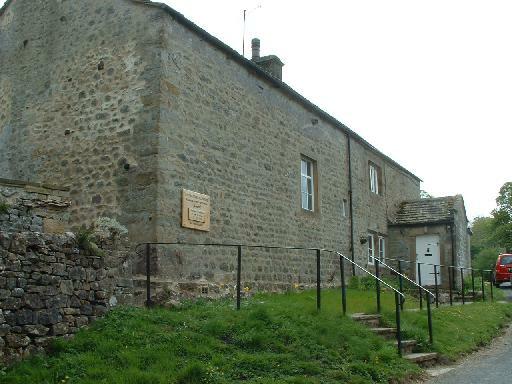 97 & 412) a Yorkshire Quarterly Meeting record of Airton meeting house dating to 1696, which may be taken as a definite terminus ante quem; however, since “new” meeting houses first began to be recorded in that year it is not apparent to what this date refers. It may be either a recording of the already well established Airton meeting house or a mention of its then recent refurbishment. By the wills of William and Alice Ellis, their Airton properties were left to Friends to provide accommodation and hospitality for visiting Friends and to pay apprenticeship fees for the children of Quakers and the poor of Airton. Among others, Josiah Box was apprenticed in 1712 to Simeon Wilkinson, linen weaver, of Otterburn, Aron Sheppard was apprenticed to John Rawson, a linen and woollen weaver of Airton, in 1724, and Christopher Hall, son of Joseph Hall of Airton was apprenticed with the help of this fund in 1727 (Thistethwaite pp 57-8). Administration of the Airton Trust Property by Settle Monthly Meeting was not without its problems. In 1774, York Quarterly meeting instructed in a minute, “Setttle Monthly Meeting to use the necessary means, that the remaining Trustees take care to remove the present Tenant, & to consider of a proper addition to the number of Trustees….” (Thistlethwaite p.89). In 1784 additional land was purchased to add to the Airton Trust Property to make it attractive for renting to a tenant farmer. Funds held by another charitable trust, in favour of a Friends school in Newton-in-Boland, were invested in the purchase of another freehold property in Airton in 1850 (Thistlethwaite p. 207). It is not clear whether this land was included when, in 1852, the Airton Trust Property’s allocation of recently-enclosed common land was sold or when, in 1904, the entirety of the estate was sold, except for the Ellis’s house and cottage, across the road from our meeting house, and the present Airton Trust Property, that is the meeting house, cottage, barn and walled burial ground (Thistlethwaite pp. 101 & 207). Particularly in letters written in 1672 and 1673 (Epistles 291 and 296), George Fox advocated women Friends’ participation in the administration of Quaker affairs and the establishment of women’s meetings to facilitate this. The first women’s Quarterly (or regional) Meeting in Yorkshire was held in 1677 and occasionally thereafter until the early eighteenth century, then twice or thrice in most years until 1778, thereafter four times a year until the end of 1906. Subsequently, there was no separation of men’s and women’s participation in Friends business and administration (Thistlethwaite p. 23). At the local level, women’s meeting were intended to take care of local affairs and to prepare reports and brief delegates to be sent to the women’s Quarterly Meetings, usually held in York. The main use of the shuttered, smaller meeting room under the gallery in the Airton meeting house was to give women Friends a convenient place to meet to consider those church affairs in which they took a particular interest: the education of children, placing of apprentices, approval of marriages, relief of the poor and care for orphans, elderly and sick Friends. After their meetings in the warmth with shutters closed, the shutters could be raised so that they and men Friends holding simultaneous business meetings in the larger room could confer with one another. It may be conjectured that the Airton partition with drop shutters was designed by Alice Ellis. As far as we are aware, it is the oldest surviving and may have been the earliest example of this distinctive feature. Two other early Quaker meeting houses in our area, those in Skipton and at Farfield, just north of Addingham, were purpose-built in the seventeenth century. Each has architectural evidence which suggests that it likewise began as a simple, low-walled structure with a steep, ling-thatched roof, open to its rafters. The indenture, or deed of purchase, for Farfield meeting house is dated the sixteenth day of the month called September, 1689. That document states that the Farfield building was being erected by the purchasers at the time of its purchase. Skipton meeting house dates to 1693. Having begun as very similar barn-like structures in the late seventeenth century, these three meeting houses now display the characters of different stages in their subsequent development. Except for its raised, stone roof and very extraneous window shutters, Farfield looks much as it may have done when it was first built. As detailed above, Airton meeting house largely retains its late seventeenth-and early eighteenth-century appearance. While Skipton meeting house has retained some seventeenth-century panelling and a mid eighteenth-century partition screen whose design appears to have been based on Airton’s, its appearance is largely the result of substantial twentieth-century additions and alterations. Together, these three buildings constitute an interesting and valuable record of regional vernacular architecture as expressed in Friends meeting houses. In 1743, it was reported to Archbishop Herring that at Airton we have 230 families of which 6 only are Quakers…. the Quakers have a meeting house where they meet to the number of about 20 on Sundays and Wednesdays. Frequently, the eighteenth-century parish-by-parish reports of dissenter activities underestimated their numbers. The Airton meeting house remained in use throughout the eighteenth and nineteenth centuries, but as the following table shows, the numbers recorded as attending at each of the Friends meeting houses in our area on particular dates were low. During at least part of this time, the upper floor to the Airton barn was used as a place where travelling peddlers exhibited their wares. According to the unpublished memoirs of Arnold Waterfall, the room was then known as The Klondyke on account of the treasures which might be offered for sale. the little village of Airton with its ancient meeting-house, dating from 1700 [which date we now know to commemorate its purchase, not its inception]. The old stone building, with the stone bench running round the little paved yard behind it, beside it the quiet grassy graveyard, and the beautiful paddock beyond, seemed all full of good memories. For fifty years this meeting has been one of the smallest in Yorkshire, but most warm is the welcome which visiting Friends receive there. Between sixty and seventy gathered to the meeting for worship at seven o’clock [in the evening]…. at the close was held… a talk on Adult Schools; and finally it was decided to start one in the meeting-house at two o’clock the next Sunday. Other Quaker meetings in the area which these Young Friends found to be still active were at Bentham, Sawley and Settle. Skipton Meeting had ceased some years previously, but Friends retained ownership of that meeting house and thirty-five people met there for a Wednesday evening meeting for worship. From 1911 until about 1935. Adult School members from Northern England attended summer gatherings which lasted for up to four weeks each year, staying in the Ellis’s house and adjoining guest cottage, attending lectures in the meeting house, and giving music recitals which are remembered by an elderly Airton resident as a notable treat of her young childhood. Arthur and Elizabeth Raistrick served as tutors most years. In a letter written in 2006, John Stober tells of a new period in the meeting house’s history. In the early summer of 1941…I wrote to the Friends Relief Service asking if I could help in any way during the university vacation…. I was asked to join a work-party at Airton Meeting House and help to prepare for the arrival of evacuated families…. Friends all over the country were offering emergency accommodation…. The Relief Service was revived to help…. At Airton we improved the kitchen by putting in a new window and laying a floor and installed electric wiring throughout the buildings…. We left before the evacuees arrived. The evacuees from Liverpool, a mother with three young sons, and a mother with two sons and a daughter who was born while they lived in Airton, slept in the back part of the meeting house, one family in the gallery and one behind the screen in the women’s room. Both families shared the ground floor of the barn as a kitchen and living room, its first floor being unsafe. From 1943 to 1948, weekly meetings for worship were attended by, among others, Phyllis and Arnold Waterfall who served as Resident Friends, by the artists Sidney and Constance Pearson, Mollie Peel and Jennie Bowman from Newfield Hall, John and Pauline Dower of Kirkby Malham, and Elizabeth and Arthur Raistrick, who bicycled over from Linton. From the late 1940s, Yorkshire Young Friends used the ground floor of our barn and sometimes the gallery of the meeting house as a hostel. In the late 1940s, improvements made to the barn included re-roofing, inserting a wooden staircase and constructing a new upper floor. For several years, country dances, or “hops”, were held here on Saturday evenings with music supplied by the Waterfalls’ gramophone. The barn continued to be used for overnight accommodation by Leeds Young Friends and others, who slept on the new first floor with a movable screen separating the men and women. From about 1970, widely advertised meetings for worship, held two or three times a year, were attended by many Yorkshire and Lancashire Friends. The first floor of the barn was partitioned into three bunk rooms and the ground floor kitchen modernised in 1983. The relatively recent date of the present ceiling of the meeting house is unknown; the extent of whitewash on the walls in the loft above suggests that it may formerly have been as high over the main room as it is now over the gallery, while re-used timbers indicate that the roof structure has been altered several times. Insertion of an iron fireplace into the ground floor, eighteenth-century surround, widening of the seat of the facing bench and insertion of the large window in the north wall may date to the nineteenth century, or perhaps to soon after 1905, when the meeting house began to be used for Adult School classes. The relatively new, wide-board pine floor rests on sleeper walls; it is not integral to the building and does not cover the remains of any earlier paving. It may have been constructed in 1941 in order to accommodate the evacuee families in 1942-3. The stairs leading to the gallery likewise replace an older, similar construction. Interesting minor features of several windows are the fixtures which held in place wartime blackout blinds. The loose benches in the meeting house are mainly nineteenth-century. One of these comes from the now closed meeting house at Newton-in-Bowland; on its back, the date 1826 and the initials J. B. may be those of the Quaker politician John Bright. The benches with hinged backs, the light globes in the large meeting room and the brass umbrella stands near the door are from the now-closed Airton Methodist chapel and its school room. The table in the gallery was made for the meeting house in 2009. Starting in 2002, more frequent meetings for worship were resumed, at first during the summer only owing to the meeting house’s leaking roof and the lack of heating. Airton was accepted by Settle Monthly Meeting as a “notified meeting” in 2005, became a “recognised meeting” in 2006, and began holding its own meetings for church affairs in 2008. As mentioned above, all of the Friends’ Airton property except for the meeting house, barn, cottage and walled burial ground were sold in the early decades of the twentieth century, with the intention that the income from these sales should be applied to the upkeep of the meeting house. However, after serving to house two families evacuated from Liverpool during the Second World War, the barn was used as a hostel, while the meeting house was only occasionally used for meetings for worship and fell into disrepair. A strenuous campaign of fundraising culminated in the meeting house’s restoration in 2008. It is now (in 2010) used for regular meetings for worship, welcomes many visitors, hosts concerts, retreats, work parties, tea parties and study days, and serves as a polling station. It is planned that continued fundraising will enable the barn to be refurbished with a new kitchen and social rooms to serve the needs of a rural community that lacks other meeting places, and the adjacent cottage repaired. Grateful thanks are offered to those who have done the primary research on which this paper is based. In addition to the authors listed below, the giants on whose shoulders this study is balanced include Don McLellan, who has made a careful study of the physical evidence of Airton meeting house’s history and origins, David Tippy and members of the Malhamdale Local History Group who have researched aspects of Malhamdale Quaker history, and Richard Harland whose researches in the Brotherton Library at Leeds, in the Friends House Library in London, and elsewhere, have provided much information which he has generously shared. His knowledge of local and Quaker history goes far beyond what is encompassed here, while his unfailing interest and helpfulness are a constant source of encouragement. Some passages of the present work are taken verbatim from Harland and Phillipson, 2007. Roger Waterfall is thanked for permission to read and use extracts from the unpublished memoirs of his father, Arnold Waterfall. All of the opinions, interpretations and errors expressed here are my own. The Airton Trust Property is owned by Brighouse, Leeds and Settle Monthly Meetings Buildings Charity (reg. 228684). It is administered by a Management Committee appointed by Craven and Keighley Area Meeting, Britain Yearly Meeting, of the Religious Society of Friends (Quakers). Anon., 2006. The Society of Friends. Times Past, newsletter of the Bordley-Cracoe-Hetton-Rylstone Local History Group. Backhouse, J., 1849. The Life and Correspondence of William and Alice Ellis of Airton. London: Charles Gilpin, and York: John Linney. Barclay, John, 1841. Letters, &c., of Early Friends; illustrative of the History of the Society, from nearly its origin, to about the period of George Fox’s decease; London: Harvey and Darton. Besse, J., 1753. A collection of the Sufferings of the People Called Quakers, taken from Original Records and Authentick Accounts. 1998 facsimile reprint of the Yorkshire entries. York: Sessions Book Trust. Boulton, D., & A. Boulton, 1998. In Fox’s Footsteps. Hobsons Farm, Dent: Dales Historical Monographs. Brayshaw, T., & W. Oliver (ed.) 1938. The Parish Register of Kirkby Malham in the County of York, vol. I 1597-1690. Yorkshire Parish Register Society. Brighouse, Leeds and Settle Monthly Meetings, 1951. An Account of the Charitable Trusts and Other Properties. York: William Sessions. Dawson, W. H., 1882. History of Skipton. London: Simpkin, Marshall & co., and Skipton: Edmondson & co.
Farr, D. N., 2003. John Lambert, Parliamentary Soldier and Cromwellian Major-General. 1619-1684. Woodbridge, Suffolk: The Boydell Press. Foulds, E. V., 1987. The Birthplace of Quakerism, a handbook for the 1652 country. London: Quaker Home Service. Gardner, S. R., 1899. The Constitutional Documents of the Puritan Revolution, 1625-1660. Oxford: Clarendon Press. Hall, D., 1758. Some Brief Memoirs of the Life of David Hall, with an Account of the Life of his Father, John Hall. London: Luke Hinde. Harland, R., 1993. The Living Stones of Skipton Quaker Meeting. Skipton: Skipton Preparative Meeting of the Religious Society of Friends. Harland, R. & L. Phillipson, The Quaker Meeting House at Airton, and some of the Friends who worshipped there. Airton: Airton Trust Property Management Committee. Long, M. H. & M. F. Pickles, 1998. The Society of Friends in Mid-Wharfedale and Craven 1650-1790. Ilkley: Mid-Wharfedale Local History Research Group. Morkill, J. W. 1933. The Parish of Kirkby Malhamdale in the West Riding of Yorkshire. Gloucester: John Bellows. Rooksby, D. A., 1994. The Quakers in North-west England I, The man in leather breeches. Eglwysbach, Colwyn Bay: D. A. Rooksby. Rooksby, D. A., 1998. The Quakers in North-west England III, And sometime upon the hills. Eglwysbach, Colwyn Bay: D. A. Rooksby. Sewel, W., 1811 (5th edition). The history of the Rise, Increase and Progress of the Christian People Called Quakers. London: William Phillips. Shuffrey, W. A. 1903. Some Craven Worthies. London & Leeds: F. E. Robinson & co., & Richard Jackson. Thistlethwaite, W. P., 1979. Yorkshire Quarterly Meeting of the Society of Friends, 1665-1966. Harrogate: published by the author. Waterfall, A., n.d. Memoirs. unpublished manuscript owned by Roger Waterfall. Whitaker, T.d., 1878 (3rd edition). The History and Antiquities of the Deanery of Craven. republished 1973. Manchester & Skipton: E. J. Morten, & The Craven Herald.